A new year! What is it about a new year that can make one feel like a slate that has been wiped clean? New resolutions (yes! this is the year I get organized! ), new beginnings, new everything. I can literally feel the unfinished business of 2005 slide of my back like butter off a hot knife. But wait…what to do with the leftover chocolate truffles that I made as Christmas presents? I know, I know. Leftover truffles?! Yes, a bumper crop of the little suckers left me with a load that I couldn’t, with good conscience, consume all by myself. So just as I tend to reivent myself with every new year, I likewise found a new identity for my truffles…as cupcakes! – Cream butter and sugar until light. – Add eggs, one at a time, until fully incorporated, then add vanilla. – In a separate bowl whisk together the flour, baking powder, and salt, then add to sugar/butter/egg mixture until no flour remains. 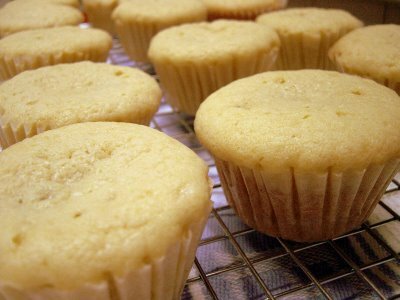 – In a muffin tin lined with cupcake papers, put a blob of batter in, filling the muffin cup about 1/3 full. 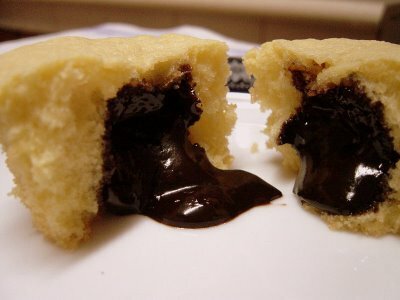 – Nestle a chocolate truffle gently onto the batter then crown with more batter until covered. – Bake for 20-25 minutes in a 325F oven. Let it cool a bit before trying one or you will be shocked speechless with a mouthful of scalding chocolate! Here are the cupcakes (below) looking very innocent, giving no clues as to the dusky chocolate darkness hidden in their hearts. Flat or no these guys were delicious! I can see how the added butter could definitely have made this too rich…but not for me. They were so moist and soft…and then the oozing chocolate decadence spilling out…woof. I had made these for a weekend trip to C’s farm, but had generously offered my brother one (just one) to taste. His proposal to “wrestle me for another” leads me to think that he may have liked them too.